Green, Yellow, and Red: Who has the right of way? The goodfirm ICBC lawyers want to draw the public’s attention to a recent court ruling involving a crash at a yellow light. Many drivers assume that the car proceeding through the intersection has the right of way. However, as seen in this case, this is not necessarily the case. In Kabir v. Simpson 2016 BCSC 1594, a plaintiff was attempting a left hand turn at an intersection and was hit when the defendant’s car continued through the intersection. 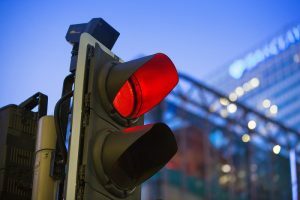 The plaintiff argued that she tried to complete her turn after the yellow light turned red and the defendant claimed that the light turned yellow shortly after she entered the intersection. In the decision, Madam Justice Watchuk reiterated the differing obligations for drivers when there is a red or yellow light at the intersection. Under section 128 the Motor Vehicle Act R.S.B.C. 1996, c. 318, when a light at an intersection turns from green to yellow, the driver approaching the intersection must stop before entering the intersection, unless the stop cannot be made safely. Under section 29, if there is a red light at the intersection, the driver approaching the intersection must stop at the intersection and wait for a green light. For those drivers making a left hand turn, section 174 states that the driver turning must yield to immediate traffic going through the intersection, but after having yielded and signaled they may complete their left turn and the traffic approaching in the opposite direction must yield to the vehicle making the left turn. After reviewing the evidence, Madam Justice Watchuck found that the defendant was so close to the intersection that she constituted an immediate hazard and therefore the defendant was the dominant driver. On that basis, the plaintiff had an obligation to yield to the defendant who was proceeding through the intersection. However, she found that the defendant was also negligent in that she proceeded through the intersection when the light was yellow despite being able to stop safely. Both the plaintiff and defendant were found to be equally at fault for the accident. Thanks for a marvelous posting! I actually enjoyed reading it, you’re a great author.I will be sure to bookmark your blog and definitely will come back in the foreseeable future. I want to encourage you to definitely continue your great posts, have a nice morning!